"I just lost complete control," said a shaken Colonel Madan K.C., the pilot of the B-2 Squirrel A-Star Ecuriel helicopter that crashed and then flipped on its side some 250 feet from the helicopter pad. 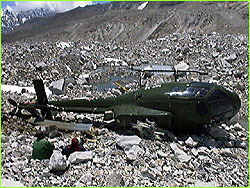 Within seconds, all at Base Camp were running toward the helicopter to help rescue survivors. Colonel Madan, the heroic pilot who rescued Beck Weathers and Makalu Gau last year on Everest, in one of the world's highest helicopter rescues, was able to climb out of the helicopter safely with his co-pilot, the only other person on board. The B-2 is a helicopter that is specially modified for performance at high altitude. "We put them on oxygen because they came from Kathmandu valley, which is 4,000 feet above sea level," explains Howard Donner. "The quick ascension from that altitude to 17,600 feet at Base Camp requires that the pilot fly on oxygen at these altitudes. If we didn't put him on oxygen they would've probably developed Acute Mountain Sickness (AMS), manifested in headache, dizziness, malaise, and lack of appetite. So we put them on a low flow oxygen just to prevent the onset of AMS, and luckily the weather was good enough to bring in a second B-2 to get them out of here." After contact was made with Kathmandu by the Italian expedition, which called in for a helicopter to rescue the two pilots, the colonel and his co-pilot joined us in our dining tent to wait for the arrival of the helicopter. Calls were made to Kathmandu by satellite phone to family and colleagues, to reassure them that all was well. It took three helicopter landings and takeoffs to evacuate the colonel, his co-pilot, and an injured French climber whom Colonel Madan had flown in to evacuate in the first place. The Colonel insisted on being the last one out, even though he could have rapidly deteriorated at this altitude. Meanwhile, the latest news from up on the mountain is that at 2:00 pm today two Sherpas, three Icelandics, one British, and one Nepalese stood on top of Everest. Six were members of John Tinker's expedition and one was a climber from the all-Nepalese expedition. The climbers broke trail through the breakable crust and then spent two hours at the south summit waiting for oxygen that was coming up slowly behind them. "We've got a plume and a half up there," said David Breashears, looking up from Camp III and commenting on the weather coming off the summit pyramid. Nonetheless, the weather was manageable enough for the seven climbers to reach the summit and head back down. As of this writing, none of the climbers have returned to the South Col. We also have reports that a different group of seven climbers (six Kazakhs and one Bulgarian) who reached the summit from the north side have all returned safely to Base Camp there. Meanwhile, David Breashears, Ed Viesturs, Dave Carter, Guy Cotter, Veikka Gustafsson, and Tashi Tenzing are now at Camp III after having a good day of climbing and filming on their way up. Dave Carter, Tashi Tenzing, and Guy Cotter will all start breathing supplemental oxygen tonight at Camp III. The others, excluding Veikka, will begin breathing bottled oxygen at Camp IV. This commits all to a summit attempt, as the oxygen supply is limited. They'll have three bottles each to get them up and out of the South Col and then each has three bottles to get them to the summit and back down to Camp IV. Veikka is attempting to reach the summit without the use of supplemental oxygen. Weather reports show an estimated 38-43 knot winds on the 23rd, which will be their summit day. "It's going to be D-Day on Everest," comments David Breashears on the numbers of climbers heading for the summit on the same day. "We have members of John Tinker's expedition, Canadians, Guy Cotter's team, NOVA, and the Malaysians all going up on the same day. But we're strong and we'll be ahead of everyone breaking trail." As the B-2 lies slumped like a beached whale on the rock and ice of the Khumbu Glacier, just a few hundred yards from our camp, we marvel at how the thin air up here takes its toll on machines as much as it does on our bodies. And at 23,500 feet, 6,000 feet above us, our team members slumber inside their sleeping bags, awaiting what will be the beginning of a sequence of arduous events leading up to the summit of Everest.